The UK Film Council is hoping to win big screen distribution for a British TV drama at the Toronto Film Festival. 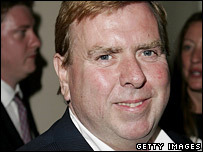 The Last Hangman stars Timothy Spall as executioner Albert Pierrepoint. Pierrepoint became the focus of national interest when Field Marshal Montgomery picked him to execute Nazi leaders following the Nuremberg trials. "There is a very high level of talent currently working in British TV drama that deserves international acclaim," said the Film Council's Paul Trijbits. "Putting The Last Hangman in front of international cinema audiences will enable the UK to demonstrate its ability to continue to produce world class cinema," said Mr Trijbits, head of the Film Council's New Cinema Fund. The Granada production will be screened to top film buyers from around the world at the Toronto Film Festival, which runs until 17 September. Yorkshire-born Pierrepoint was believed to have been responsible for more than 450 hangings over 37 years, including Ruth Ellis and Derek Bentley, before his sudden resignation in 1956. He died in 1992 having become opposed to capital punishment.